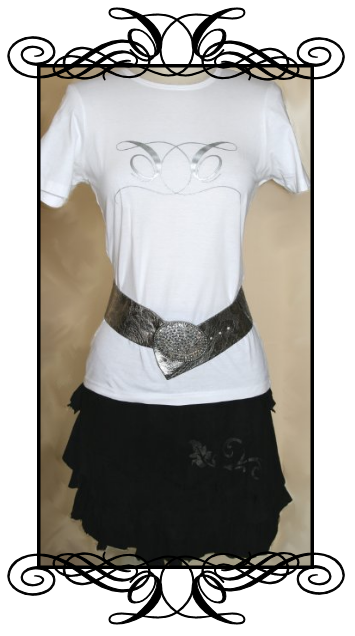 Black burnout features a Thunderbird that coordinates with the Kadee Coffman buckle by Johnson and Held. Photo with model and actress Bobbi Jeen Olson and photography by famed western photographer Diana Volk! One of the softest shirts you will ever wear! It is a tri-blend burnout made with 50% polyester, 32% cotton, and 18% rayon. Features original Rose Tattoo artwork by our very own, Meredith Lockhart! 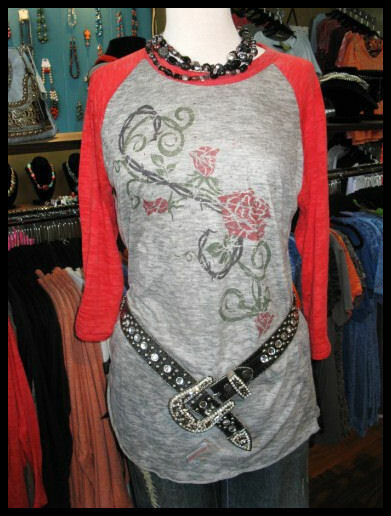 Accented with Vintage Red raglan sleeves and AB Swarovski Crystals! Couture Cowgirl’s new signature release is a whimsical and enticing mix of fruit, berry, and citrus rain. A trace of leather leaves a distinct impression. This blend is the answer to those seeking a contemporary and crisp blend designed for all seasons. We had a blast reading your entries in our most recent contest on facebook! But… we can’t let our facebook friends have all the fun. So here it is a contest for our Twitter friends! Follow @CoutureCowgirls if you haven’t already! For every 10 entries we will give away one prize! 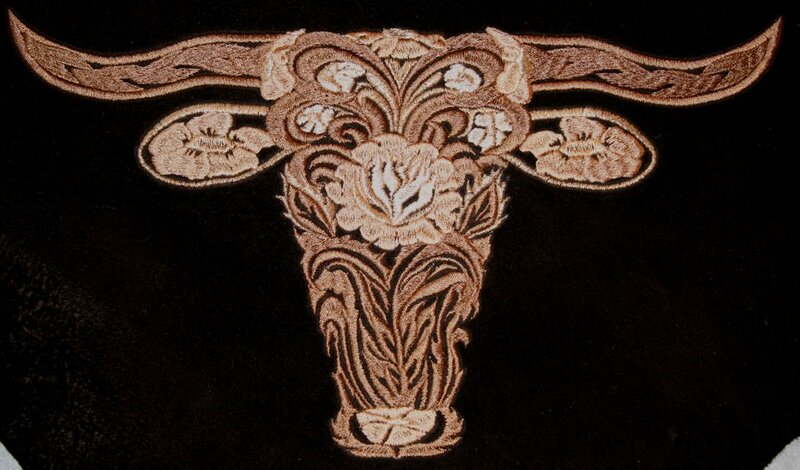 We had a great time reading the post from our most recent contest about what makes you a ~COUTURE COWGIRL~ on facebook! Just in case any of you are not on facebook we would love to share our winning entries with you! 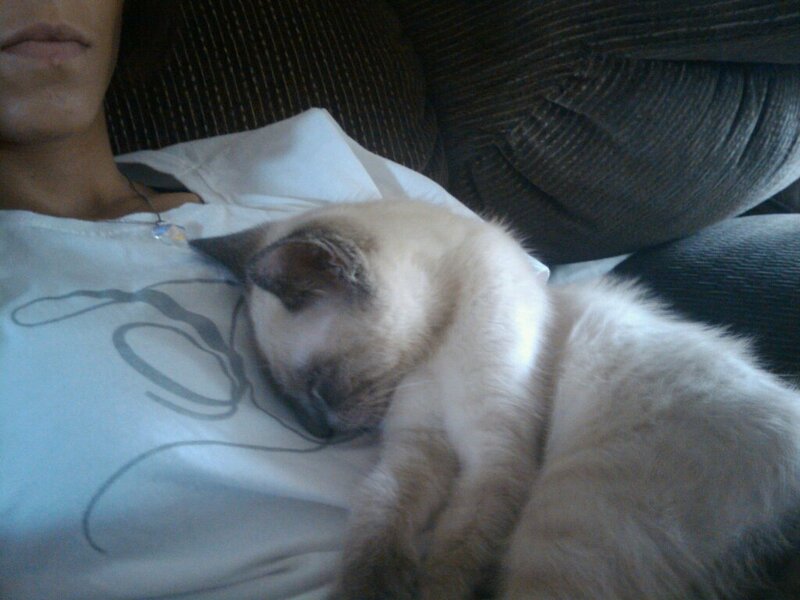 Photo from Ms-Jenn Parrella with her cat Moonshine and her CC logo Top! My daughter is a couture cowgirl! She just went on her senior trip and through her graduation ceremony with her cowboy boots on!!! The only one of 120 seniors to proudly wear cowboy boots under that graduation robe! And it was because her fellow school mates love her independence to be a “couture cowgirl”!!! I am couture cowgirl because i always ready to get down a dirty, I dont mind dressing up one day then jumping in the mud the next. I am happy girl who knows when you got your boots on no one thinks twice of crossing you. I’m a Couture Cowgirl because even though I can out-ride, out-shoot, and out-work the men when working cattle I can still clean up and be all girl. Not many girls can say this, but who else other than a Couture Cowgirl can sport alfalfa in their hair and get away with it? I was all ready for prom when an after hour…s customer showed up and needed a truck load of hay and of course I was the only one around to do it so I changed back into my working clothes loaded up the ton of hay he needed, sent him on his way,picked out as much alfalfa as I could, got back in my dress and headed off to prom !!! Yeah I’m a Couture Cowgirl !!!! I am a Couture Cowgirl because I design my own style! Whether modifying my thrift store finds, or pairing a rock and roll look with my cowgirl boots, I have my own style… just ask my friends who always want to raid my closet! Thanks again to everyone who participated and congratulations to the winners! We are getting ready to kick off another contest so be sure to check back often! ~Write 2-5 sentences on our facebook wall about what makes YOU a Couture Cowgirl. ~Have your friends LIKE your post. ~ Voting will end June 7th at 10:00 central time. 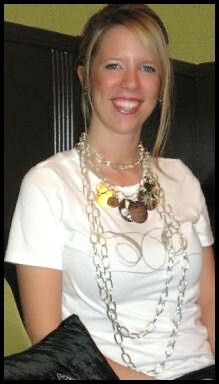 ~The top 5 Couture Cowgirl’s will receive our CC LOGO white top! We wanted to share a few snapshots from our first night in Dallas! Design America will be open today from 10-7 if any of you are in the Dallas area, we would love to meet you! Are you ready for a Premier Western Designer event? Clear your calenders May 6-8 and head to Dallas, TX for Design America! The “Texas Teaser” to the left is just a glimpse of one of the many pieces that will be showcased by our very own founder, Meredith Lockhart! Missy and Sarah will also be there modeling and helping out in her booth. Come and meet us!! Meredith Lockhart has been a designer for many years creating one of a kind pieces for Country Music stars, Miss Rodeo America Contestants, and many individuals that have a desire for impeccable quality. Be sure to check out her Design America Video HERE! Friday Evening, May 6, is the ASTONISHMENT, Preview Gala. If you are looking for an exclusive experience with a Premier Fashion show and time to meet the artist and shop before the show is opened to the public, this is the night for you! Tickets for the Preview Gala are $100. Saturday and Sunday the show opens to the public and you can get into the doors for $20. Artist will be showcasing items that are museum quality! The event will be held at the Gaylord Texan Resort & Convention Center, Longhorn Convention Center, Exhibit Hall E .
This is our first release for Spring and Summer here at Couture Cowgirl! The colors are bright and vibrant and just make you feel good. The artwork is nothing short of spectacular and is hand drawn by our very own Meredith Lockhart. The back tattoo image adds a fun twist. 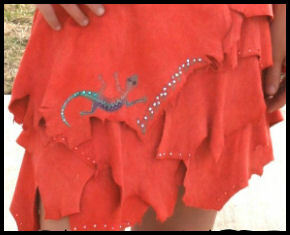 Pair it with our Orange handkerchief hem skirt for a fun night out with the girls. Couture Cowgirl’s love to ride (four legged and iron)…pictured is Couture Cowgirl, Missy’s, Cobalt Blue Iron Horse and Pigwolf’s Pig. I promise you all this taste way to good to be good for you! Slice apples into about 16 slices each and place them in a baking dish. Sprinkle with your favorite sugar free sweetner and cinnamon to taste. I personally LOVE a lot of cinnamon! Bake in a preheated 350 degree oven for about 45 minutes. Top with toasted almost and bake an additional 15 minutes. For many of us we have seen the signs of spring and even summer temperatures! This is a wake up call for everyone that intended to get that beach body before swim suit season but just hasn’t gotten around to it…We may be pointing a finger at ourselves right now if that makes you feel better! So here it is, lets help everyone with a few recipes that taste way too good to be good for you! Email us your “No way this good for me…” recipe to info@couturecowgirl.com with Cooking Contest in the subject line or post your recipe on our facebook page. The winner will receive a CC logo apron! Every day, we get up, get dressed and go about our day. What does how you dress say about you? Your personal sense of style tells a story. It can tell people you are trendy, classic, subdued, flamboyant, bold or timid. This is what is conveyed before you even meet someone, before you can show your personality with your actions and words. Understanding this and using it to convey what you want about your self is a large part of competing for rodeo queen titles. As a queen, you are always “on” and judges and spectators are looking at what you wear and making assessments. What kind of story do you want your queen wardrobe to tell? To illustrate this, I would like to share my experience in 2008 at the National High School Rodeo Queen Competition. It was my second year reigning as the Minnesota High School Rodeo Queen, and after my first year at Nationals, I understood the importance of telling a story with my wardrobe. My first year I had no rhyme or reason to what I wore: royal blue, buttercream, black (a big no-no at the high school level! ), sky blue and violet just to name a few of my outfit colors. I placed 16th and was passionate about doing better so I talked with past judges, past national queens, and Meredith Lockhart of Merezia to ensure I would be prepared for “Round 2” in 2008. From all of the knowledge ladies I talked to, I learned the importance of telling a story with your outfits. Judges use what you wear to remember who you are. Think back to the first time you met someone: they wore glasses, had long curly hair, and were dressed for chores. The next time you see them, you don’t recognize them: they have no glasses, have shorter straight hair and are dressed to impress. They changed every aspect you used to store them away in your memory. Changing your look drastically is the worst thing you can do when you want to stand out and have judges remember you. Keeping your hair, make-up, and wardrobe congruent throughout a contest is vital to being remembered. Don’t make the judges work to remember you, make it easy for them to identify you and understand who you are and what you want to represent. 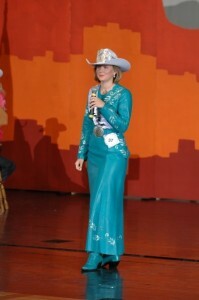 I wanted to convey that I was bold, elegant and mature with my wardrobe at the National High School Rodeo Queen Contest. I wanted the judges to see my personality and convey that I would be a capable queen. I told this story with three leather outfits, presented in a very strategic order with cotton blouse outfits interspersed. The first time the judges would see me was during the Introductions and Impromptu speech. I wanted to catch their eye and set the stage for the rest of my story. I wore a Magenta lambskin top with dyed-to-match jeans and boots. The top’s detailing covered the front and back so when walking to and from the microphone I would be flashy. This outfit was designed to look bold, sophisticated and to get the judges to look at the queen from a state that was under their radar. It worked. The next events with the judges were the Personal Interview, and the Judges’ Social followed by the Speeches and Modeling that evening. For the Personal Interview, I wore an Icy Turquoise leather top with matching jeans and boots. As I was within 10 feet of the judges, this outfit was less flashy than the Magenta outfit, but had similar swirling designs in the Swarovski crystals and hand painting. This outfit was designed to convey elegance, quiet confidence and maturity to show another side of me now that the Magenta outfit caught the judges’ attention. Though the colors of the outfits are vastly different, the necklines were similar and the detailing was very similar which allowed it to follow the story I was laying out for the judges. After my interview, I prepared for the judges’ social, introducing the next piece in my “fashion line-up”. I wore a vintage Roper button down cotton blouse with periwinkle embroidery and a few strategically placed Swarovski Crystals. This shirt continued the theme of elegance with gently swirling embroidery and soft colors and showed my more casual, traditional western side. That night, for the Speeches and Modeling, I again broke out a bold, eye-catching outfit. A deep teal skirt and top, with silver, swirling hand painting and Swarovski Crystals carried on the story: swirling patterns, elegance, and bold maturity. The bold color and designs related this outfit back to my impromptu outfit and the color stayed with the blues I had been wearing all day. I was presenting a well-planned story to the judges much like a fashion designer does with a collection to show cohesion. That year, I placed 2nd in the National high School Rodeo Queen contest. I believe much of my success was because of telling a story with my wardrobe. Of course, a wardrobe will not win you a contest, but by telling a story with your outfits, you make people sit up and pay attention to what you are saying, which can win you the contest. Best of luck sharing your story, in queen contests and in life! Does Spring Fever have you ready to pack up and go? Road trips, shows, parks, and picnics are calling our names! 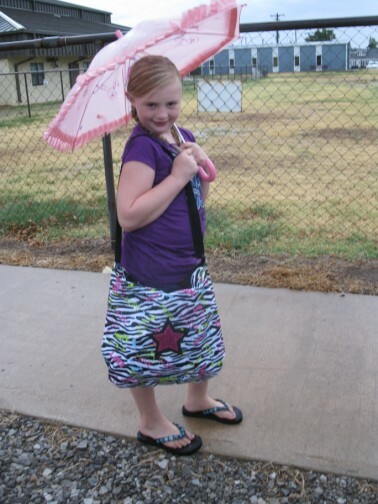 We have one unique stylish piece to offer that will be a great addition to any place Spring Fever takes you! Get yours today at CC shopping! Be sure to head over to Facebook and Twitter and tell us where Spring Fever is taking YOU! Green Beer and Corn Beef and Hash come to mind when we think about St. Patricks Day….we wanted to share a few beverage recipes that may be fun additions to the norm! Blend to perfection! A fun twist would be green coated sugar around the rim of the glass! It appears the weather in Oklahoma is going to be TOASTY this St. Patricks Day, so here is a personal favorite that still contains beer but has a nice lime twist! Combine the above in a pitcher and Enjoy! I landed my first ‘real’ job in 1966 as a senior in high school. I needed clothes and a surfboard desperately and the only way I would obtain these perceived treasures was to become employed and earn enough money to buy them. My friend, Peggy called one evening and in her usual excited bubbly, smiling voice told me she had discovered a job posting in our local newspaper. At that time if you wanted a job you would look in the Daily Breeze under the correct heading, “Help Wanted Female”. Many times the jobs would be the same as they were when posted under the heading, “Help Wanted Male” but the requirements and compensation for employment were not the same. Wardrobe requirements usually were white shirts and ties for men, while women (girls) were expected to wear skirts and dresses. Now, anyone with a modicum of fashion sense would not be caught dead without the accompanying accoutrements consisting of the correct shoes(heels), jewelry, make up and pocket book. Monetary compensation separating the two headings for men and women (girls) would usually add up to more than $100.00 per month and that was a lot of dough in the mid sixties. 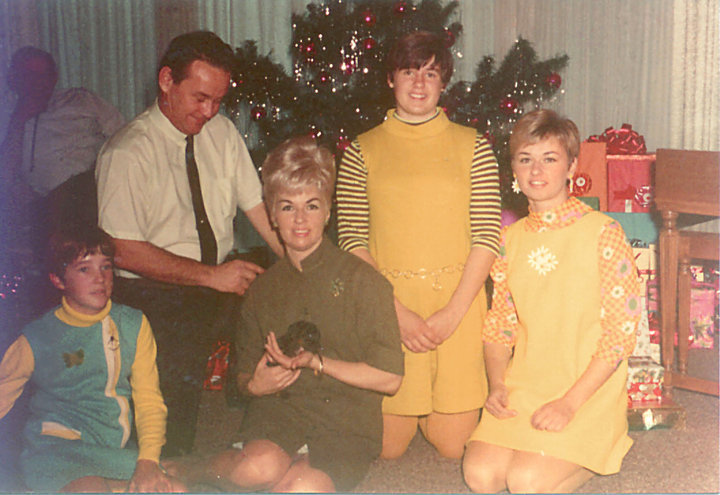 As bubbly, shinny faced high school girls, we never questioned the practicality of the wardrobe requirements or the inequity of the wage differences – We were gratefully ecstatic to apply for and get jobs as photo inspectors at the new Polaroid facility in El Segundo. I mean $4.25 per hour was almost twice what you would earn as a candy girl at the Fox Theatre. It was great fun, three good friends working together…. Peggy and I as photo inspectors and Jim, who hired on as a developer trainee at $4.75 per hour. This job was posted only under the heading, “Help Wanted Male”. Four hours of fun and aching feet! The heels, little one inch pumps, would start their torcherous assault about 45 minutes into our shift standing on a concrete floor. Jim wore sneakers or loafers and told us to quit bellyachin’! I must say, we bucked up pretty good.A few short years later we became part of, lived through, embraced, repelled, celebrated, survived, Womens Liberation. As with anything that swings a pendulum either to it’s most easternly or westernly point, there was good and bad. To this day, for the life of me, I do not understand why any woman would want to burn her bra. For the life of me, I cannot understand any reasoning behind paying a woman less than a man for the same job. Nothing, other than they could get away with it. So, Womens Lib in all its radical glory was a good thing for the most part, but it certainly was not a new thing. Still, I did not own a pair of Levi’s until I was twenty two years old. Back in the late 1800′s, Evelyn Cameron was accustomed to living a luxurious life and born to a wealthy British family. She would marry a Montana naturalist and move to eastern Montana where she would become the first female frontier photographer. Over the next thirty years, Evelyn chronicled western history and the lives of it’s inhabitants by taking thousands of photographs. 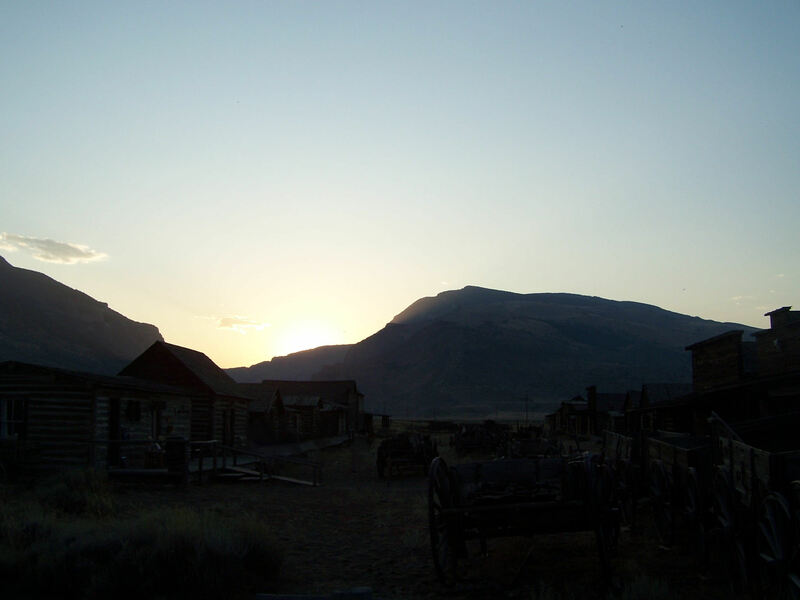 At the same time, she took care of most of the chores and duties necessary of one living on an early western ranch. It was forbidden and unlawful for women to dress in a lude and unfeminine way. This meant Evelyn and her female friends were bound by law to wear long skirts and dresses with petticoats, women were not permitted to wear pants, boots, overalls…. all proper and practical for ranching men but unlawful for women to wear. Evelyn witnessed her best friend and neighbor get her long, flowing skirt caught up in her saddle. Unable to free herself, the horse trampled and killed her. Evelyn vowed never to wear “unsuitable” clothing again and designed a costume that consisted of a split skirt. She said, “Although my costume was so full as to look like an ordinary walking dress when the wearer was on foot, it created a small sensation. So great at first was the prejudice against any divided garment in Montana that a warning was given me to abstain from riding on the streets of Miles City lest I might be arrested! Later, those full-looking costumes would find their way into the rodeo arena, evolved into a safer-but-uglier-than-dirt practical trick riding costume known as bloomers. 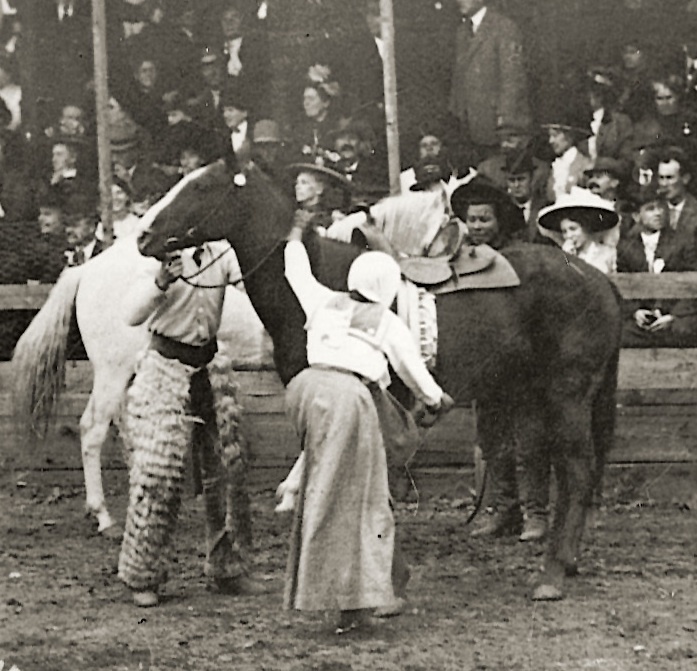 Even in the rodeo arena, competing sometimes against their cowboy counterparts, cowgirls were expected to look and act like the ladies of their time. 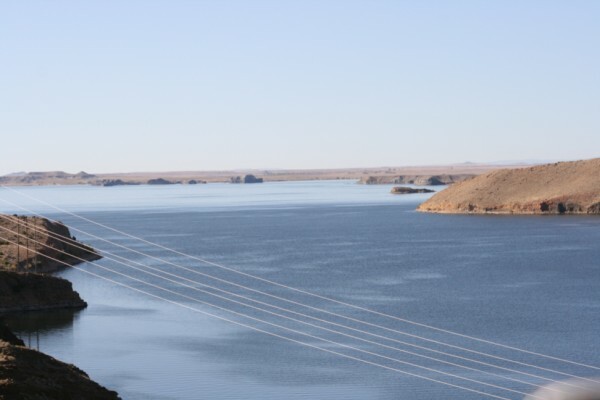 Quite a trick when you are trying to stay stuck like glue to the hurricane deck of a twisting, sunfishing bronc. Champion Cowgirl, Vera McGinnis nealy suffered the same fate as Evelyn Cameron’s friend when the corset beneath her skirt became tangled on the saddle horn of her bronc. Vera was so angry she removed the corset while still in the arena and flung it over her shoulder vowing never again would she wear such a monstrocity! 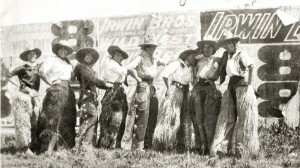 Vera is credited with wearing the first pants specifically designed for women while performing in rodeo events. Her idea came from a pair of mens pants with the zipper in front. She thought that was too masculine, removed the zipper and placed it to the side for a more feminine look. Soon, all the women performers and competitors were wearing feminine pants with the zipper to the side, thanks to Vera. 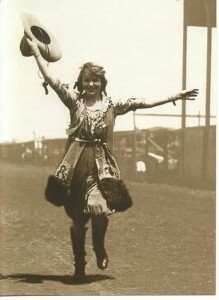 For rodeo and wild west show promoters like C. B. Irwin, it was necessary to portray cowgirls as feminine and beautiful. We embraced the beauty of Mabel Strickland and fooled the crowds with ringers for the great cowgirl Prairie Rose Henderson. 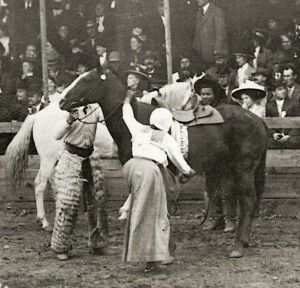 Henderson, a gifted athlete could ride broncs slick and with the best of them but unfortunately for her, she did not possess the physical feminine attributes needed to showcase her skills. 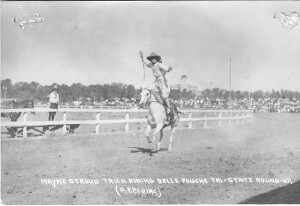 Irwin, the master showman had the idea to allow her to ride but when the time came to introduce her to the press, he used more feminine characters – ringers who would appease the public need for a more feminine cowgirl. Mabel Strickland, Texas Guinan, Dorothy Page, Marlena Dietrich all went on to glorify the cowgirl of the west in western movies. Oddly, the entire country became more comfortable with the needed changes in clothing due mainly because of the physical nature of the job, when it was portrayed by a feminine beauty on the big screen. Thank you, girls! I will be forever grateful not to a wear corseted, long, heavy skirt the next time I decide to climb aboard a snortin’, twistin’, reach for the stars, sunfishin’ bronc. A feminine woman is immensely powerful. I have never believed we would find our place or fulfill our worth emulating cowboys or any other man. The differences between yin and yang, even in the saddle are blatent. Maybe, if we can recall our history and the women who walked before us, it won’t be necessary to take the proverbial two steps back and one step forward when the subject of femininity and equal rights raises it’s twisted little head again. Just ask Mabel Strickland, Bonnie McCarroll, Prairie Rose, Bertha Blancett as well as a host of hundreds of unnamed ranch women and female homesteaders. 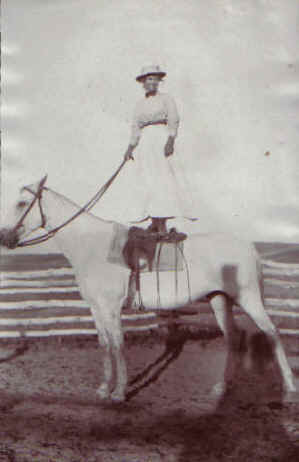 As Bertha said, “I always behaved as a lady and the men always treated me as such.” Few question that Bertha Blancett could ride broncs with the cowboy’s best. 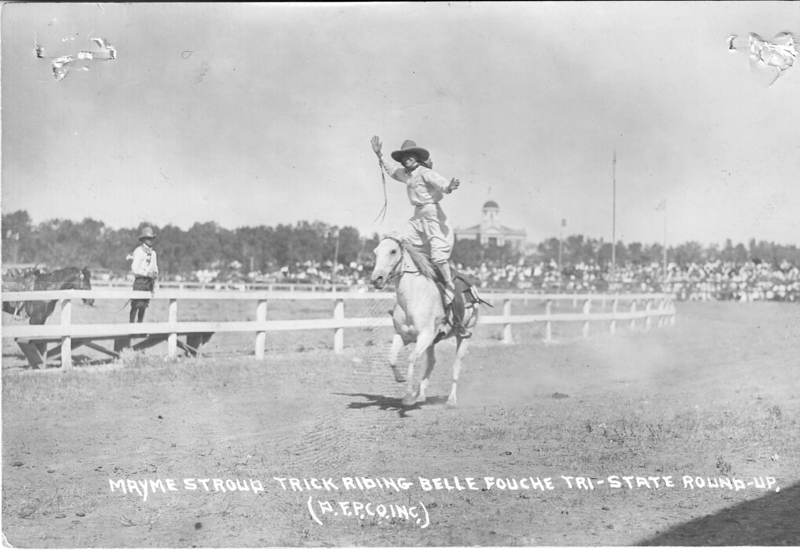 Prairie Rose could design and sew a costume as well as ride a bronc, and stately mannered Mabel Strickland could rope and tie a steer better than most of her cowboy counterparts. So well that one cowboy asked Mabel’s husband, Hugh to keep her away from the cowboy competitions because she made them look bad! Maybe, if we can recall our history and the women who walked before us, it won’t be necessary to take the proverbial two steps back and one step forward when the subject of femininity and equal rights raises it’s gnarly little head again. Maybe this time we will revel in our femininity, wear Levi’s to work, a sequined gown to dinner and satin to bed and smash the archaic remnants of that glass ceiling in one last, swift blow, knowing it is our very feminine right to do so. Last fall in September, at the Cody High Style Fashion Show, we introduced our new hand dyed skirts, handkerchief hem skirts and dress. For spring, it seems that the Boho or Bohemian Look is quite popular in mainstream fashion and was on the runways last fall for Spring 2011. You see skirts and dresses with all sorts of ragged edges, zigzag hems and strong colors. This VOGUE video ~The New Bohemians~ gives you a great sense of the look! Boho originated from the Gypsy style that was best known for it’s mixture of prints and bright colors. The style is described as flowy, flirty, romantic, free-spirited, rocker chic, theatrical, artsy and just fun to wear! 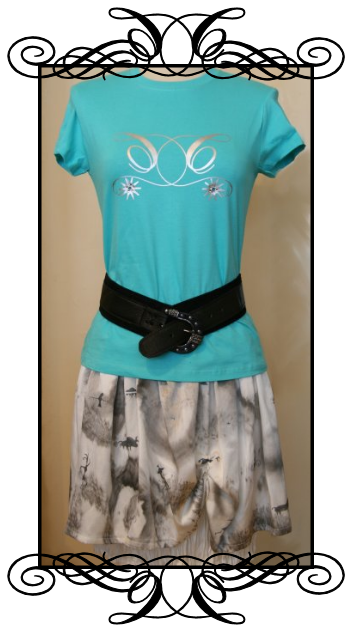 The skirts can be paired up with your favorite t-shirt, vest, wild belt and jewelry. 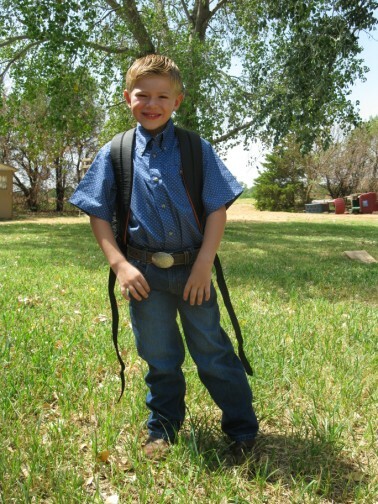 Lets not forget a favorite pair of cowboy boots or western flip-flops to add a western touch to the look! This look is a personal favorite of ours! Our tattoo style butterfly tee fits right into the Boho look with our Capri Blue Handkerchief Hem skirt…check out this look and our other Spring/Summer items that possess the fun, flirty, flowy Bohemian feel that we are all falling in love with! 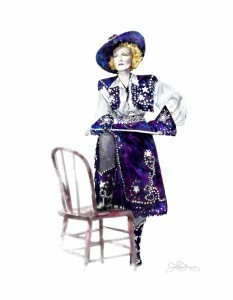 A Couture Cowgirl is YOU, Proclaim it Proudly! And with Style, of course…. I would like to start by thanking all of you for your votes and suggestions! When we reviewed the poll results Beagle took the lead in individual breeds, also rescue a pet or mixed breed seemed to be very popular……so this sweet little girl is the best of all the above. She is a beagle mix. 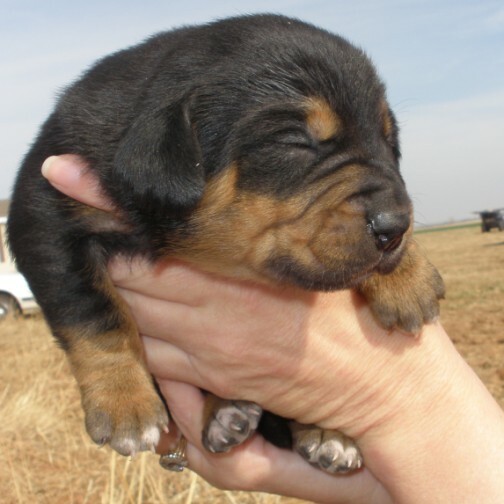 17 days old and we will get pics along the way until she is old enough to come live with Becca. Becca has already named her DAISY! Here is a peek of the cute little girl! Line rimmed 10 X 15- inch baking pan with foil using extra wide foil so it goes up the side. Fit crackers side by side in a single layer until pan is full. Spread pecans all over graham crackers. Melt butter in small pan over medium heat. Stir in sugar and bring to a boil for about two minutes until candy thermometer reads 238F degrees. Remove from heat, stir in vanilla and pour over crackers. Bake in 375 oven 8 to 10 minutes. For additional yumminess, sprinkle with chocolate chips. Put pan in freezer for 10 minutes till cooled. Break up graham crackers and enjoy! I was in Louisiana this past week for a good friends wedding, and didn’t even realize I was flying into New Orleans on the first weekend of Mardi Gras….guess how I found out…… that car rental to Lafayette cost triple the normal rate! Yes, New Orleans was preparing for the rush of people that come to celebrate in a long known tradition in Louisiana. So I asked myself, what do I think of when I think of Mardi Gras? Beads, Parades, Masquerades, Parties…..but did I really know where the tradition originated? NO! So that is the inspiration behind this post and we hope that you all enjoy this as much as we did. First what are the colors of Mardi Gras and what are their meanings? Everywhere I went while in Louisiana this past week was decorated elaborately with these colors! It looked like a purple, green and gold Christmas! I knew about the parades etc, but had no idea that individuals spent so much time decorating their doorways, homes and yards for the event. Who knows where the first version of Mardi Gras originated? The celebration we all know about today can trace its history to ancient Rome, where the early Christian church adopted some of the traditions of pagan, pre-Christian, society and mixed them with rituals that had been developed to celebrate Easter. The result was Mardi Gras, which means “Fat Tuesday,” a reference to the custom of partaking in extra food and drink prior to the observance of Lent, a 40-day period of fasting and abstinence that commences with Ash Wednesday. Mardi Gras came to America in 1699 with the French explorer Iberville. Under French rule in the late 1700′s, pre-Lenten masked balls and festivals were common in New Orleans. However, the festivals were banned when New Orleans came under Spanish rule. In Twenty years after New Orleans became under US law the ban was lifted in 1823 when the Creole populace convinced the governor to permit masked balls. In 1827 street masking was again legalized. The first documented parade was in 1837, however I am sure that it was many years before it took on the elaborate form that we all know today! While I have always wanted to attend “THE GREATEST FREE SHOW ON EARTH” I never realized all the history and am more interested than ever! 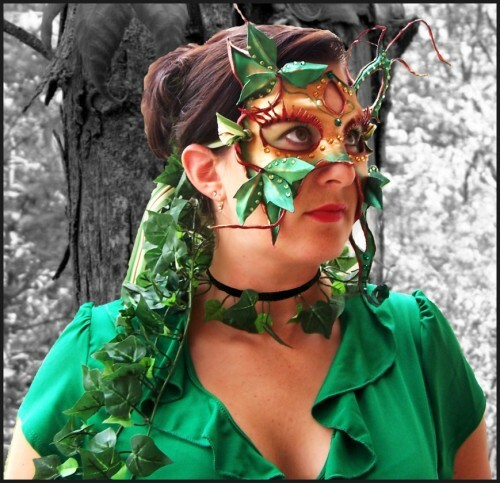 So grab your mask and purple, green, and gold and jump on the first plane to New Orleans! 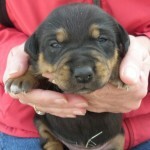 Missy’s little girl, Becca, is on a puppy hunt! 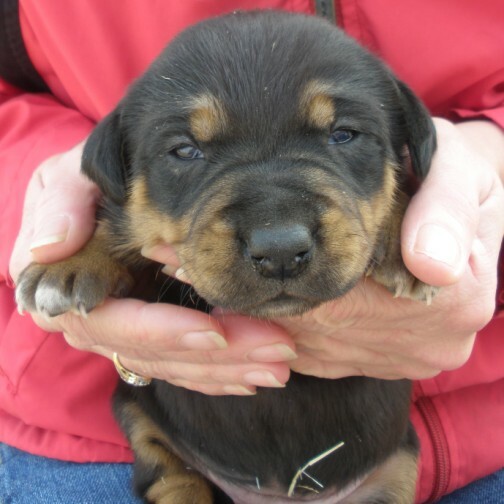 Help us decide what breed we should get. Looking for a loving pet that will play with the kiddos and live MOST of the time outdoors. A puppy that DOES NOT have interest in cattle will keep it from getting in too much trouble around the farm. We are leaning towards a beagle, but would love to hear your suggestions of what you would recommend! Anyone in Oklahoma that may have the puppy we are looking for, please send us the breed and contact information for that too! Combine broccoli, cheese, bacon and onion in a large bowl. Prepare dressing in a small bowl by whisking together the red wine vinegar, sugar, pepper, salt, mayonnaise and lemon juice. Combine dressing with broccoli mixture. Cover and refrigerate for at least 2 hours. Enjoy!!! While we enjoy the beauty of an occasional pretty snow it has left many of us with a craving for the warm sunshine spring has to offer. As we peek into Spring, we want to know WHAT your picks for spring fashion will be. Check out the below PANTONE Spring 2011 Fashion Colors and weigh in your vote! Meredith and Missy had a discussion about New Year Resolutions and how neither one of us ever make them, because we are sure to break them. Well our conversation turned to Reverse Psychology and what if we made a list of everything we wanted to accomplish this year, but you guessed it….In REVERSE! Wake up every morning with an I don’t care what I get done or on what time schedule I get it done attitude. Eat ridiculous amounts of sweets and be a couch potato. Spend less time with the ones I love and care about. Only cook recipes we have always relied on. Live and make all decisions inside the box. Stay indoors at all times. Make 2011 the worst year ever!!! Well if Reverse Psychology kicks in like we think it will, 2011 is stacking up to be one amazing year! 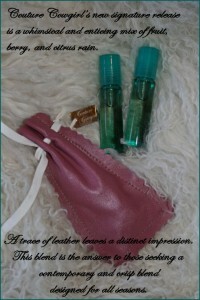 Couture Cowgirl Signature Perfume FREE SAMPLE! Want to get a taste of what the new Couture Cowgirl Signature Perfume smells like? We are offering the first 50 people people that email us their address a free sample card with the scent! We know you will love it, so email us today for your free sample card! Couture Cowgirl is a roll on versus the spray perfume. Adelia Ganson explains, “Couture Cowgirl” contains no alcohol, so it doesn’t evaporate like many perfumes. In scents that contain alcohol, many times the main emphasis of the scent is on the first spray, and the resulting few minutes of scent. Alcohol-based scents evaporate quickly due to high alcohol content, which causes the scent to lose effect very quickly, sometimes in just a few minutes. Alcohol is also a common allergan and respiratory irritant, though many people don’t know this. Many times people who think they are allergic to scent are actually allergic to the alcohol in the products they are spraying. “Couture Cowgirl” contain no alcohol and is designed to last for several hours, so it will change over time on each person’s skin. This allows for layering of scent that simply isn’t possible with alcohol-based scents. Holiday Festivities are just right around the corner and we wanted to show you how to take the number one selling Couture Cowgirl item following the Cody High Style Runway show and make it Holiday Glam! Start with one of our fun colors in the handkerchief hem skirt that we hand dyed in Mottled Brown, Capri Blue, and Orange. Pair it with coordinating leggings to keep those legs from catching that winter chill and of course boots from our friends at STETSON. A fun neutral sweater, so you don’t take away from the mottled effect of the skirts. Now have fun with those accessories from Couture Cowgirl founders Meredith and Missy! A belt made by Meredith of Thistles West and jewels made by Missy of Silver Steer Designs add the perfect amount of Holiday Glitz! We have limited quanities of the handkerchief skirts available for guaranteed Christmas delivery, so be sure to order yours today! Couture Cowgirl changed their avatar on Facebook and Twitter to pink letters on black for the month of October, in honor of Breast Cancer Awarness. We had countless request for a CC tee in the same color. Then we took a poll on facebook and twitter, and you voted for a black burnout, shortsleeve, with a pink CC logo! Couture Cowgirl’s, IT’S HERE! The short sleeve crewneck burnout is adorned with a pink crystal Double CC logo! We wanted to put together a look for you, so be sure to look for the belt from Thistles West, Jewels from Silver Steer Designs, and Boots from our good friends, STETSON! 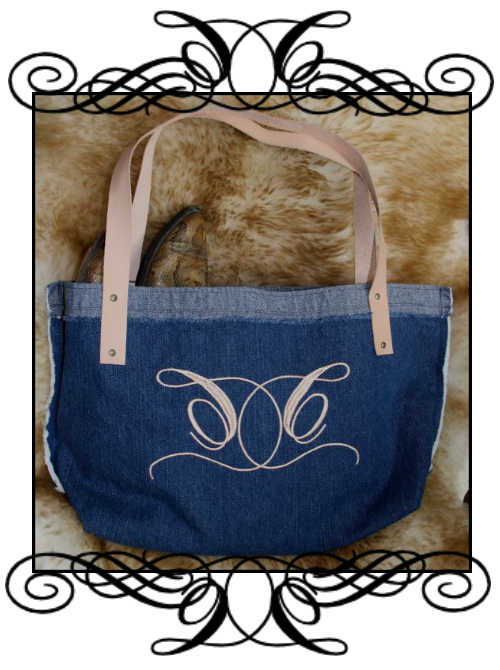 Of course you can get Couture Cowgirl Apparel right HERE! Click on any of the pics in the above photo collage and it will take you to the purchase page for the item, or email us at info@couturecowgirl.com for any additional information! This con-GLAM-oration may be our FAVORITE ensemble that walked the CHS 2010 runway! The dusty eggplant, hand-dyed flowing dress set the stage. A fun focal point was the hand embellished CC logo buckle paired with a black belt by Thistles West. 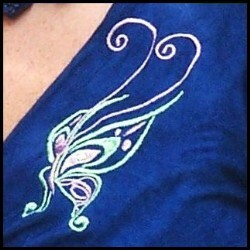 The details in the handpainted butterflies on the jacket by Thistles West is breathtaking! We added glitz with the layers of peacock pearls in the necklace’s and earrings by Silver Steer Design. A touch of funky with the large purple turquoise slab ring. The top and bottom add a touch of class with the impeccable craftsmanship of the hat by Trent of Greeley Hat Works and the boots by STETSON. Click on the pics for links to purchase or email us at info@couturecowgirl.com for additional information. Mask making started in the 13th Century in Venice. Along the way, these highly decorative mask were made out of leather, some say in the 1600s. I have been fascinated with them since researching mask for a project I was doing with a youth arts organization in Kansas City that worked with adjudicated and inner city youth. 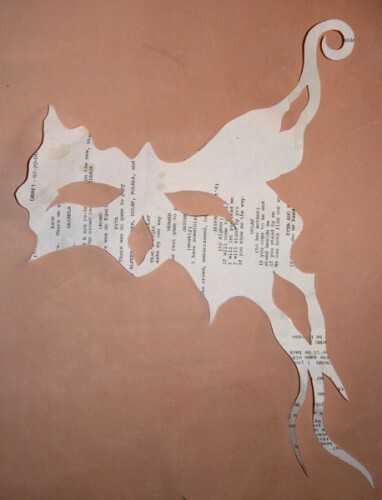 I find mask making such a satisfying form of art, as there are no rules and i can just let my imagination run wild. 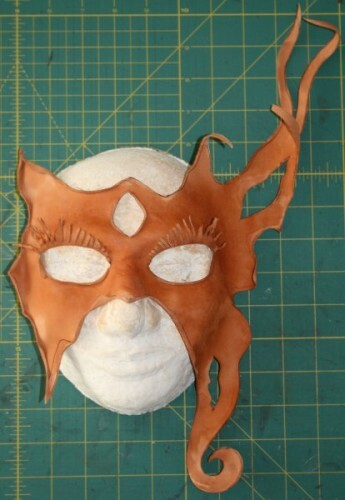 The mask I make are purely another form of wearable art. I love to make things that people can wear, have fun with, and feel wonderful wearing them. 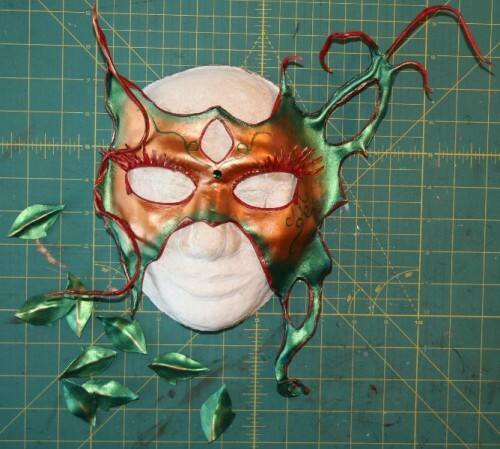 My masks are made of leather but sometimes I use paper mache to give added texture to them. All are hand painted and some are embellished with Swarovski crystals. They can be worn for Halloween parties or to a masquerade ball. Many people purchase these masks and hang them on their walls for decoration too. 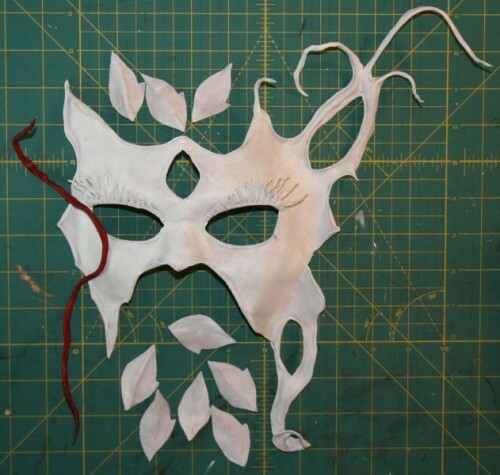 The photos depict the basic stages of making this mask. 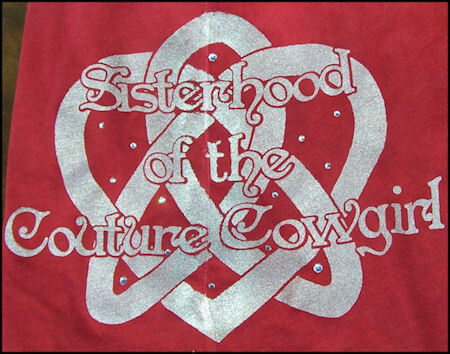 It’s bigger than YOU, it’s bigger than ME, its the Couture Cowgirl Sisterhood! Before we loaded up and headed to the CHS fashion show we gave you a sneak peak of the first item in the new “Sisterhood” Collection! This idea came about when we (Meredith and Missy) were discussing the unbreakable bond between cowgirls all over the world. We have watched as you wrap your arms around a fellow cowgirl, who’s heart is breaking, and give her virtual hugs and words of inspiration. A Cowgirl is the strongest woman in the world, but sometimes life throws us curveballs! How wonderful is it to have the support of so many people!!! We have also watched as you praise and give pats on the back as your fellow cowgirls reach their goals! This group of Cowgirls is a Sisterhood and we are proud to be a part of it! Or first top in the collection is ironically a “Hoodie” A hoodie makes you feel warm and cozy when you slip it on, and paired with jeans it will take you through all your daily chores! Headed out on the town? Add a skirt and waist belt and you are ready to knock those Cowboy’s boots off! In addition to the sisterhood celtic sign on the hip we added a crystal CC logo to the front for a fun twist to this modern version of the hoodie! We love the wide neck line and the “Extra Long” sleeves! I had so much fun last week with our little project, What is your barn name. We had to laugh because amazingly enough, most of the names you generated for yourselves from the list we came up with were so well suited to your personalities. Those that weren’t, were still entertaining because they couldn’t be further from your true identity. What was really fun for me was actually coming up with the names for you to generate. Names such as “Hot flash Hannah” and “Menopause Meg” kept coming into my head but in an effort not to offend anyone, we skipped over them. The best part was that if you didn’t like the one you were given, you could just go in and pick another one. Everyone had a great sense of humor about the project and Missy tells me we had quite a few hits on that page. Judy Earp made a good point when she said that it would be even more fun to have the guys go in and generate a name for themselves. Since the names were Cowgirl names, I have to agree that any man brave enough to admit they are now called Firefly or American Beauty is a man with a sense of humor and a lot of confidence. So guys, please, for our entertainment, go generate a name and let us know what it is. The foundation of Couture Cowgirl has always been more than a brand, it is the STATE OF MIND that defines each and every one of us. For fall we have introduced a really fun burnout that we dip dyed in one of the hottest colors of the season. It features the words STATE OF MIND in purple. The background is “A Couture Cowgirl is the girl next door that can drive a tractor, fix a five course meal, watch a baby and still be stylin’. She’s the executive who dreams of wide open spaces. She’s the commuter that would rather be on a horse than the freeway. 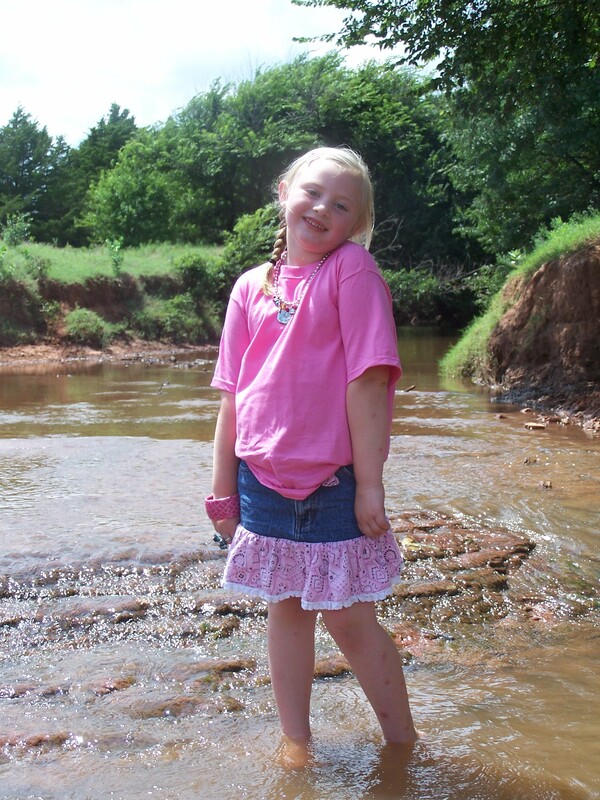 She loves fashion, she loves the ranch. She is the one who is all woman and can do a man’s job if she needs to. 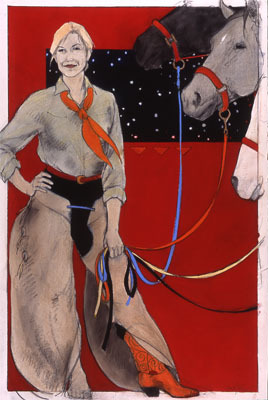 A Couture Cowgirl knows when to walk, when to trot and when to close the gate. She is the it girl, she fixes the fence on the way to town and still looks like a million bucks at dinner.” in silver ink. Jeans to a skirt and this burnout can take you from Ranch to Runway! 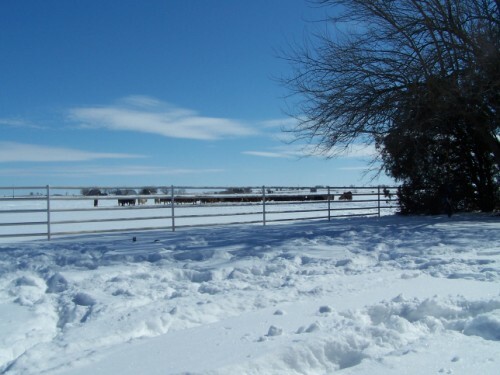 Tena Bastian writes a weekly column at Couture Cowgirl called Tena’s Take. This week her column was titled, “What’s in a Name?” Make sure to head over and read her enlightful and sometimes humorous take on What’s in a Name and you will see where the idea for this fun name generator came from. 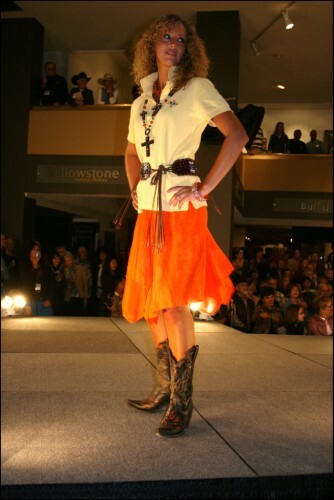 Couture Cowgirl hit the runway at Cody High Style September 23, 2010. We wanted to share a small clip with you. The show was so full we had to find a spot upstairs and miss the end of the runway, but ladies that is a great problem to have! Listen to the audience reaction to the line, we are so excited to see what the future has in store for Couture Cowgirl! Once again, we are beyond grateful to STETSON for providing the boots that these ladies danced down the runway in! 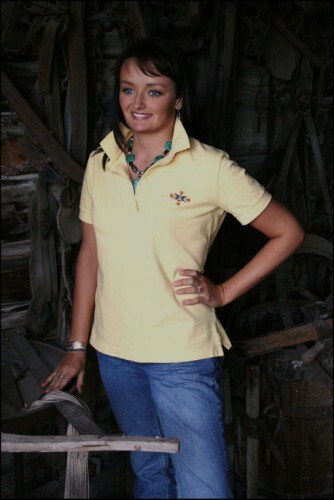 A staple piece in every Cowgirl’s wardrobe is the all too familiar polo. Couture Cowgirl wanted that staple piece to be something fun that you can’t wait to pull from your closet on a daily basis no matter if you are headed out to the barn or dinner. Love the front…Wait until you see the back of this polo! Splatter background with embroidery cross detail in vibrant colors that are perfect for every season. You will make a statement in this piece! You have made your statement in the barn, now lets show you how to take this look out on the town. Paired with our hand dyed handkerchief skirt, boots by Stetson, jewelry by Silver Steer Designs, and belt by Thistles West. You have a killer combination that was seen on the runway at the Cody High Style Runway show last week! “Couture Cowgirl” The scent of COWGIRLS! Many months ago Missy made a trip to Kansas to visit Meredith…we told you we were working on something very exciting, but left your minds to wonder about our secret. Today Couture Cowgirl will walk the runway at Cody High Style, and we feel this is a perfect day to debut our secret! Couture Cowgirl’s new signature release is a whimsical and enticing mix of fruit, berry and citrus rain. A trace of leather leaves a distinct impression. This blend is the answer to those seeking a contemporary and crisp blend designed for all seasons. We are very excited about another aspect of our perfume, we opted to do a roll on versus the spray perfume. Adelia Ganson explains, “Couture Cowgirl” contains no alcohol, so it doesn’t evaporate like many perfumes. In scents that contain alcohol, many times the main emphasis of the scent is on the first spray, and the resulting few minutes of scent. Alcohol-based scents evaporate quickly due to high alcohol content, which causes the scent to lose effect very quickly, sometimes in just a few minutes. Alcohol is also a common allergan and respiratory irritant, though many people don’t know this. Many times people who think they are allergic to scent are actually allergic to the alcohol in the products they are spraying. “Couture Cowgirl” contain no alcohol and is designed to last for several hours, so it will change over time on each person’s skin. 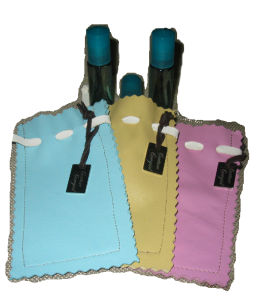 This allows for layering of scent that simply isn’t possible with alcohol-based scents. 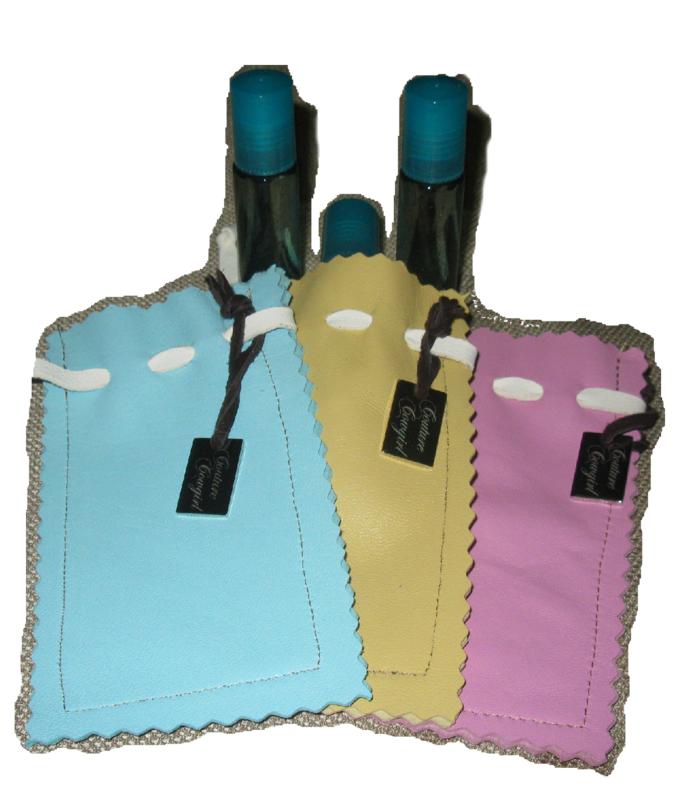 Each roll on bottle of “Couture Cowgirl” will come in a handmade leather bag with a signature Couture Cowgirl tag! When Couture Cowgirl launched, we knew that it was more than a brand! It was a STATE OF MIND…You have all defined that state of mind in your weekly submissions of your ~COUTURE COWGIRLISMS~ on facebook each Friday! By the way, this is our favorite day of the week at CC, we love connecting with all of you and hearing what defines the CC STATE OF MIND for you! There is something else that we have noticed, it is an unexplainable connection of cowgirls. We will call it a “SISTERHOOD” At the Cody High Style Show CC will debut the first in our new SISTERHOOD collection. As Sisters, lets help all our fellow cowgirls celebrate their joys, support them when the trail gets rough, and be a a trustworthy friend! The sneak peek of our first tee in this collection is based around a celtic sisterhood design representing an unending knot that keeps us all tied together. We hope that you all love our new collection and join the SISTERHOOD of the Couture Cowgirl. Join STETSON on facebook as they countdown to Women Who Design the West! “Stetson believes in making things right and the best they can be. In a time when fast and sloppy too often defines the ‘quality ‘of some of the products we buy, it is our privilege to recognize those people, women specifically in this case, who devote themselves to craft and artistry at the highest level and induct them into the Stetson Craftsman’s Alliance. Dedicated to the recognition of craftsmanship across generations, the Craftsman’s Alliance honors the best of the best across multiple disciplines: fashion, jewelry design, leather, furniture, beading, painting and sculpture to name but a few. We are particularly excited to induct these 10 talented women into the Alliance at a ceremony during the prestigious Women Who Design the West event in Cody, Wyoming which will take place from September 23 -25th. Visit www.contemporarywesterndesign.com for more information about this fabulous event and check out the artists’ work. Make sure to tell Meredith Congratulations on this honor and follow her Couture lines on facebook. Thistles West, Merezia, and of course Couture Cowgirl! We would again like to thank STETSON for providing the boots for Couture Cowgirl and Thistles West during the 2010 Cody High Style and Boot Scootin’ Boogie Runway Shows! We have been giving you sneak peeks of what will be gracing the Cody High Style Runway this September in the Couture Cowgirl line, so today we wanted to share a piece that we are both very excited about! This design is original artwork by the talented Meredith Lockhart, screen printed and hand shaded by Missy Unruh. The girls have combined their talents for a unique stunning piece. Roses are making an appearence everywhere you look in the upcoming seasons fashion and this is how we Couture Cowgirlized the elegant rose! Hope you enjoyed this sneak peek and we can’t wait to share the design in its entirety this month! “Go West” Is a simple phrase defined by Stetson as, “The longing to leave behind the everyday and set out for parts unknown.” John B Stetson heeded that call 140 years ago when he created the brand we all know as STETSON, the number one brand in this country! Couture Cowgirl has had an amazing relationship with Stetson since its debut wearing their jeans in the first photo shoot. As the Cody High Style runway show approaches, STETSON is the go to choice for fun, high quality, classic boots. Ginger Wallace has been amazing to work with and shipped boots our way today to be modeled with Couture Cowgirl and Thistles West at the 2010 CHS! We couldn’t be more appreciative of everything Stetson has done for us!!! Let’s get all you Couture Cowgirl’s in a pair of Stetson’s today! We found a few HOT boots from STETSON to share with today….but we were careful not to share the boots we picked for the runway show. Thank You again Ginger! We appreciate everything you have done for us and for your friendship! Our grunge tee hit the market as one of the original Couture Cowgirl pieces and we love the grunge design so much we are debuting a new version of the tee on the Cody High Style runway this September! 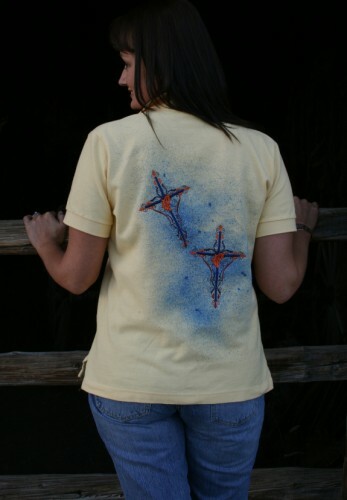 We are going to give you a peek of the original artwork by Couture Cowgirl Meredith Lockhart that is screened on the tee. 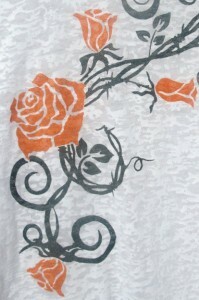 Like we said, this is just a sneak peek so you will have to wait until this fall to see the whole design come together! It will be paired with a fabulous dyed skirt that is sure to knock your boots right off! 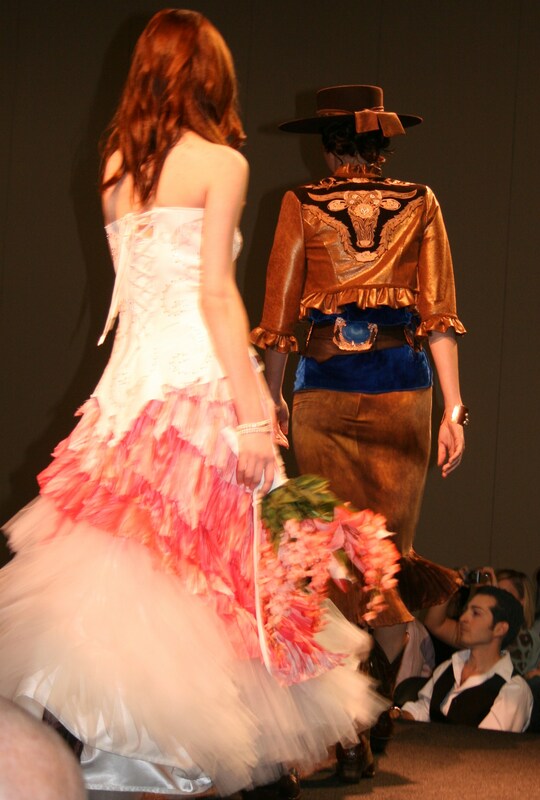 Last week we told you that Couture Cowgirl has been invited to the prestigious, Cody High Style Runway show! We would love to see all you there and meet you face to face. So many events are going on this week so we wanted to give you a little peek into what Cody, WY has to offer! This is a fine art sale and show with a western theme! The art exhibition is housed in the Buffalo Bill Historical Center! Meredith and Missy are very excited to check out Donna Howell-Sickles art exhibit this year and the mere thought of taking one of these pieces home is exhilarating! Cody High Style is a celebration of western decorative arts including, exhibition from today’s best contemporary artist, workshops, seminars, tours, and of course the high energy runway show! Yes, this is the runway show where you will find the new fall fashions for Couture Cowgirl! 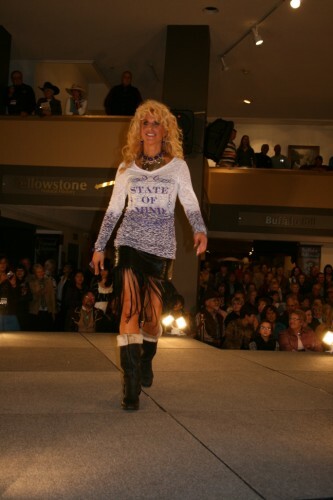 Downtown Cody becomes center stage for a rockin runway show highlighting styles of the west! All the stores are open late while you enjoy this unique street festival! Style West, established by the fabulous Thea Marx, is the next generation show for emerging artist! It includes booths by artist as well as two interlude fashion shows daily! 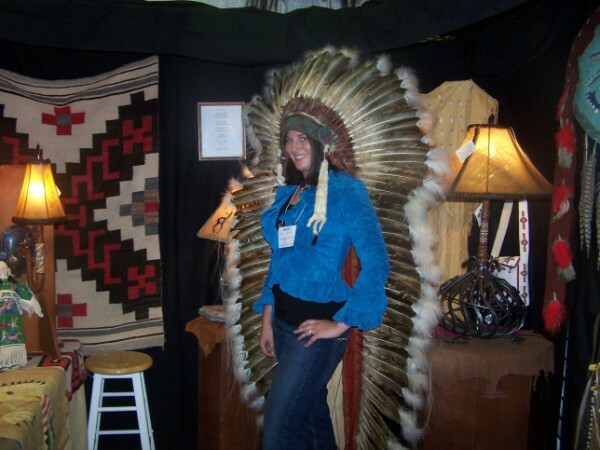 Couture Cowgirl Missy visiting exhibits in the 2009 Style West show. On this site in 1895, William F. (“Buffalo Bill”) Cody laid out the original town-site of Cody, WY, which was named in his honor. Old Trail town preserves the lifestyle and history of the frontier west through a rare collection of authentic structures and furnishings. 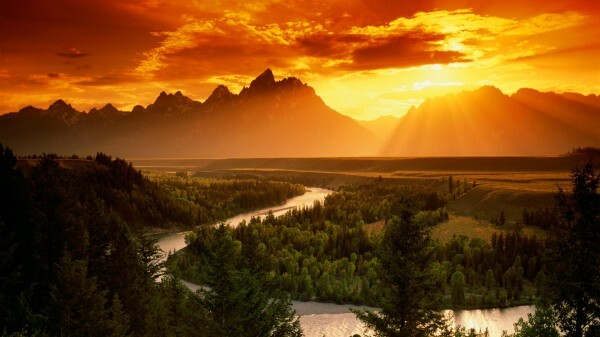 Whether you are looking to see beautiful country filled with history or to shop a fantastic collection of unique western apparel, furnishings, and art Cody, WY has something to offer! We look forward to seeing you this September in Cody! One year ago in September, Meredith Lockhart and Missy Unruh met face to face in Cody WY. Meredith was attending Cody High Style and Style West with her well known line Thistles West. Missy was on her first road trip with Silver Steer Boutique. The ladies enjoyed dinners and conversations about fashion. This lead to months of phone calls, an unbelievable friendship and soon a partnership that you all know as Couture Cowgirl. We hope that you all will purchase your plane tickets or jump in the truck for a road trip to see an amazing collection of western fashions, jewelry and home furnishings all in one place! The Cody High Style Fashion show will take place September 22 at the Buffalo Bill Cody Museum. Style West begins September 23 and goes through the 25th! CC Gets a Little Funky! Couture Cowgirl added a little Funky to our STATE OF MIND design with an aqua zebra print burnout! This is a VERY limited edition piece. We will offer two of each size S through XL and when they are gone…they are GONE! In a subliminal effect behind the STATE OF MIND frame is our defining words written by the talented Thea Marx of Contemporary Western Design. 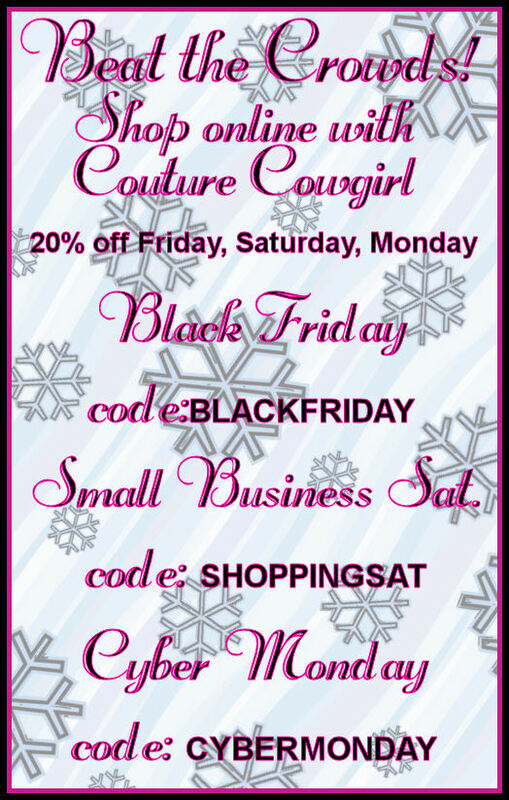 Couture Cowgirl Has You Covered! This is an elegant piece that has versatility unmatched by any in its class! Headed out on the town? Wear this fun sundress with your favorite boots and pair with fun chunky jewels! Headed to the beach? Wear this as a cover up and you will turn heads! How about to a classy dinner? Wear as a skirt paired with a blouse and you are dressed to kill! This sundress/skirt combo is hand dyed a beautiful coral. 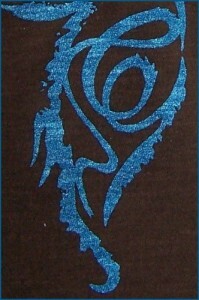 Then embroidered with turquoise barbwire and a rowel with the CC logo at the hem. 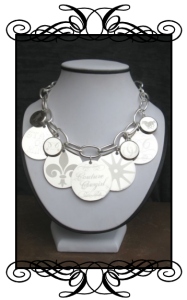 We are ecstatic to share the newest piece in the Couture Cowgirl line! Do you remember when we asked you to vote for the color that you would like to see on a Couture Cowgirl piece? You voted for Indigo, and it was a fabulous choice! This figure flattering twisted front tee is hand dyed indigo, that was the easy part because you took care of that for us! Now the decision of what to put on this piece… Meredith and Missy spent a long time trying to decide on the perfect design and their love of butterflies solved the next piece in the puzzle! 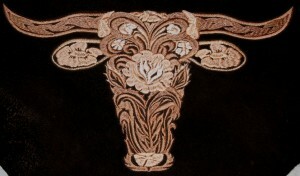 The butterfly represents a peaceful side of the cowgirl. How many of you enjoy a second to watch as a butterfly flutters by in the hay meadow or graces the heads of wheat? The ladies behind CC find joy in these beautiful creatures and wanted to include them in the design! 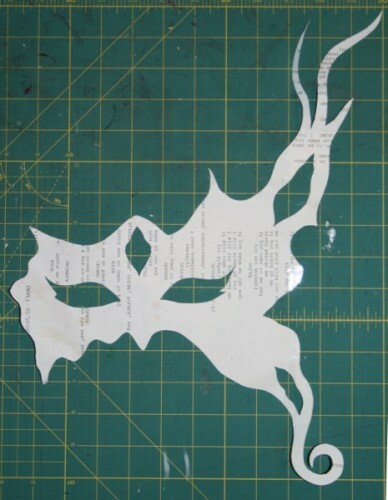 Now for the last part…how to make it COUTURE COWGIRL? 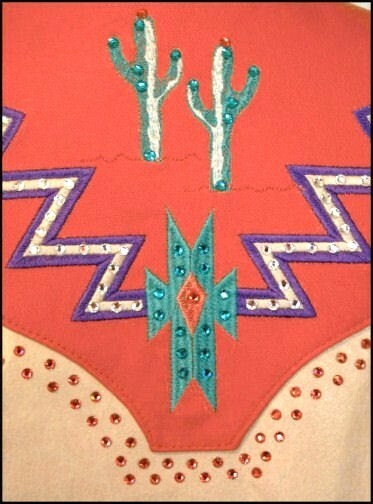 Look closely at the detail in the butterfly wings and you will find hidden Couture Cowgirl C’s! 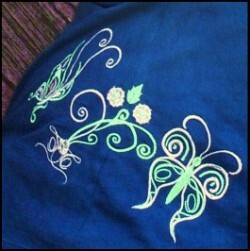 The embroidery detail is in ice violet and jade lime. Love the look of the faded indigo and jade lime skirt, this hand dyed beauty is also going to be a new addition to the CC line! It is graced with crystal accents for a little extra sparkle! This shirt looks equally beautiful with a pair of your favorite jeans to add a little class to the daily wardrobe! This is a favorite of the gals behind CC and we are sure it will be a favorite of yours! Above we told you about the hidden Couture Cowgirl C’s in the design of the butterflies, we added a close up of the hip design and the shoulder design, lets see if you can find them! Love It, Hate It…You told us if YOU would wear it! Love It, Hate It, Would You Wear It? Fashion is All About Individuality! We asked, you voted, and the results are in!